The tagline “The Sound of Love and Joy” tells the story of The Lesbian & Gay Big Apple Corps. Since its formation in 1979, this band of brothers and sisters has been making music and art for audiences across the United States and Canada. The recipient of dozens of awards from NYC Heritage of Pride’s coveted Best in March Award to Rochester’s little-known but equally appreciated Ruby Slipper Award, the Big Apple Corps Marching Band has been seen by millions in such diverse appearances as a parade to commemorate the bicentennial of George Washington’s Inauguration, a performance in a church basement in Brooklyn, concerts at Carnegie Hall and Lincoln Center’s Alice Tully Hall, and the New York City Veteran’s Day Parade. The Lesbian & Gay Big Apple Corps Symphonic Band has shared the stage with such luminaries as Harvey Fierstein, Rita Moreno, Liz Smith, Arthur Laurents, Randy Graff, Edie Windsor, Liz Callaway, Stephen Schwartz, and the New York City Gay Men’s Chorus. But not only has the band performed with the famous, it has performed for the famous: the Big Apple Corps’ music has been heard by three American presidents and by countless celebrities along many parade routes. A proud founding member of the Lesbian and Gay Band Association, the Big Apple Corps has performed from coast-to-coast with the LGBA massed band, featuring the combined membership of 30 bands from around the world. With a membership of over 100 musicians, color guard members, and Band Aides, The Lesbian & Gay Big Apple Corps plans to go on lifting the hearts of audiences in concert halls and along parade routes for years to come. 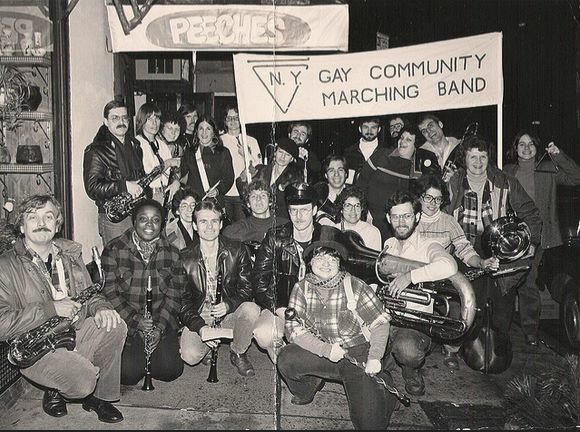 In 1979, ten years after the Stonewall riots, New York City’s gay band was born. At the time it was only the third such band in the United States. 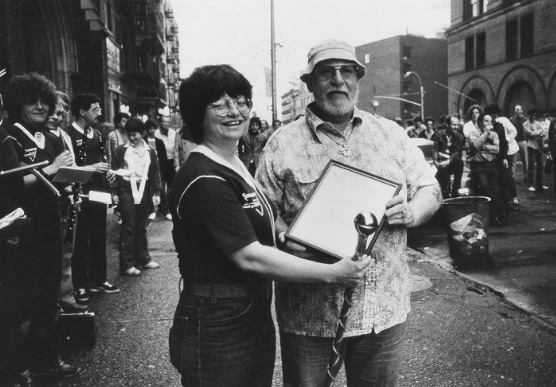 The spark for this novel idea came at the same time as the First National March on Washington, D.C. As New Yorkers prepared for the rally, two gay musicians, Nancy Corporon and Bob Wolff, had a dream of their own, inspired by Jon Sims, a San Francisco musician credited with founding the gay band movement. With Jon’s help, Nancy and Bob were soon posting flyers all over Christopher Street asking musicians to get their instruments out of the closet and join the ranks of a very special new band. Only one year later, that band would become the first openly gay and lesbian musical organization to perform at Lincoln Center. Today, The Lesbian & Gay Big Apple Corps is New York City’s premier symphonic and marching band. The symphonic band performs several concerts each year in venues ranging from Symphony Space to Carnegie Hall. The marching band performs up and down the east coast, from D.C. to Toronto. Larger concerts are often performed in conjunction with the Lesbian and Gay Band Association, and have included performances at the Paramount Theatre, the Hollywood Bowl, the 2000 March on Washington, the inaugurations of Presidents Clinton and Obama, and Gay Games events around the world.